On Friday, July 24, Croatia Airlines transported its 20 millionth passenger during its almost 20 year history. The passenger, Boris Jakopović, was travelling on a scheduled service from Amsterdam to Zagreb. At Zagreb Airport, Ivan Mišetić, the airline’s CEO handed the passenger 2 return tickets to any destination within the Croatia Airlines network as well as a 4 day hotel accommodation voucher at that destinations. On Friday, the airline also marked 5 years since becoming a regional Star Alliance member. The airline should become a full member by the end of the year as the alliance plans to shut down its regional network of airlines. Croatia Airlines first operated 20 years ago as Zagal-Zagreb Airlines. While it mostly performed charters it was Croatia’s first airline. Two years later, in 1991, Croatia Airlines was formed and it began operations from Zagreb to Split. A year later, in 1992, the airline began its first scheduled international services, with its first destination being Frankfurt. The airline has flown 11.14 million passengers on international services, 6.71 million on domestic and 2.14 passengers on charter services. Croatia Airlines transported its millionth passenger in 1994, while from 2000 the airline has had over 1 million passengers annually. The trend will continue this year as well. 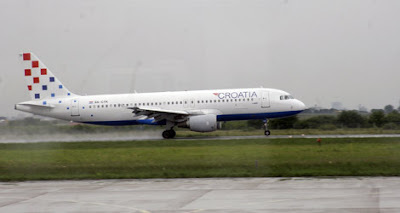 Croatia Airlines has so far transported 900.000 passengers this year and is expected to break the million mark soon. The airline is experiencing a decline in passenger numbers of 4.7% in the first 6 months of this year, which is still much less then other airlines operating within the Ex-Yu republics. Croatia Airlines along with Adria have really done well in the region. They have made decisions which have only strengthened there position and I'm sure they will continue to do so in the future. Congratulations Croatia Airlines! Croatia Airlines and Adria Airways have been making mature decisions and have been most successfull because of that. They are about to become full Star Alliance members and exceed 1 million passengers per year. Hopefully, Jat, B&H and Montenegro can follow them. A great achievement, let's hope it doesn't take another 20 years to get the next 20 million pax! A simple formula for flight operation and sensible ventures/expansion has worked very well for the airline, though perhaps a little more initiative (and some additional regional destinations) may have seen the figure reached a little earlier. Croatia Airlines only exists because it has been largely shielded from the toughest competition. Their cost base is still too high - when they get that down to a manageable, Aer Lingus type of level, then they can dream about surviving another 20 years.